BUFFALO, N.Y. -- The Mid-American Conference champion University at Buffalo women's tennis team earned ITA Academic Team honors, while four individuals were named scholar athletes, the Intercollegiate Tennis Association announced. As a team, the Bulls had over a 3.2 cumulative GPA throughout the fall and spring semesters. This is while still managing to have a record-breaking season that saw UB win its first ever regular season MAC crown, going undefeated in league play. Overall, the Bulls tied a school record for victories with 17, reaching the NCAA Tournament for the second straight season and the third time in school history. 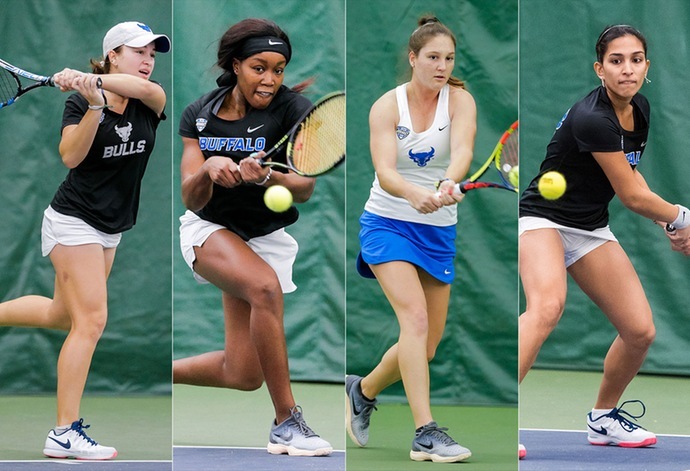 Individually four players earned ITA Scholar Athlete honors, led by junior Chantal Martinez Blanco, who was an Academic All-MAC selection and was named a Distinguished Scholar Athlete. The San Juan, Puerto Rico native, went 23-8 this past season, including going 12-6 at first singles and was 7-1 in league play. She went 19-8 in doubles action with her partner Lolade Ogungbesan. Through three seasons, Martinez Blanco carries a career singles record of 64-29, just 19 wins shy of the school record for victories. Ogungbesan also was named an ITA Scholar Athlete in her lone season with the Bulls. She went 26-6 in singles during the season, the most wins of any player in singles action this past year. She had a number of memorable victories including clinching wins in both the MAC Regular Season Championship and the MAC Tournament Championship. Fellow transfer Arianna Paules Aldrey earned herself ITA Scholar Athlete honors as well in her first season with the Blue and White. Aldrey went 17-4 in singles action, including a 12-2 performance at sixth singles. Junior Sanjana Sudhir was UB's fourth Scholar Athlete selection. Sudhir, who has twice been named to the Academic All-MAC team, had a breakout season for the Bulls as she went 20-3 in singles action, including a perfect 4-0 at fourth singles and 9-0 at fifth singles. The ITA All-Academic Team award is open to any ITA program that has a cumulative team grade point average of 3.20 or above (on a 4.00 scale). In order to earn ITA Scholar-Athlete status a player must meet the following criteria: 1.) be a varsity letter winner, 2.) have a grade point average of at least 3.50 (on a 4.00 scale) for the current academic year, and 3.) have been enrolled at their present school for at least 2 semesters (including freshman through senior year).